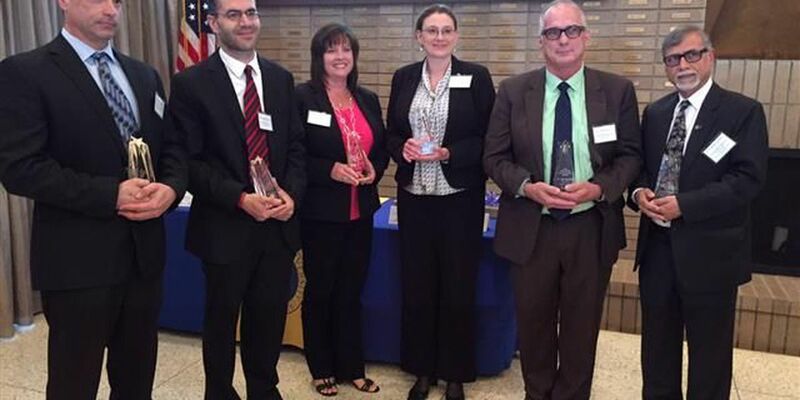 SOUTHWEST LOUISIANA (KPLC) - Six McNeese State University faculty members were awarded 2016 Pinnacle Excellence Awards Monday ceremony. Established by Pinnacle Entertainment Inc., the parent company of L'Auberge Casino Resort Lake Charles. the annual award recognizes outstanding faculty achievement in McNeese's business, education, engineering/computer science, liberal arts, nursing/health professions and science colleges. Dr. Jeff Stevens, assistant professor of management and entrepreneurship, College of Business: “Total Student Advising Program (TSAP)” focuses on increasing student retention, as well as student degree completion through an innovative advising program that focuses on the total student. Dr. Angelique M. Ogea, assistant professor of education professions, Burton College of Education: “Eliminating Roadblocks for Students in the Department of Education Professions: Ensuring Student Progression by Offering Praxis Study Sessions" offers up-to-date Praxis study materials in Frazar Memorial Library, as well as monthly study sessions for students for the initial teacher licensure program and for their education degree programs. Dr. Pankaj Chandra, professor of mechanical engineering and head of the Department of Chemical, Civil and Mechanical Engineering, College of Engineering and Computer Science" “IMPROVE: An Approach to Enhance Advising and Retention” focuses on creating a student handbook for freshman engineering students that includes all of the necessary resources available on campus and some guidelines for the day-to-day management of time, study habits and lifestyle challenges. Dr. W. Steve Thompson, assistant criminal justice professor, College of Liberal Arts: “Police Academy Certification” provides funds to purchase equipment and fund training necessary to sustain the McNeese Criminal Justice Academy Certification Program so they're ready for service with a law enforcement agency. Katrina Carter, assistant professor of nursing and assistant head of the Department of Nursing, College of Nursing and Health Professions: "Collaborating and Implementing a Living-Learning Community for First-Year College of Nursing Students at McNeese State University" explores development of a living-learning community for nursing students at McNeese and promote engagement and involvement of current resident nursing students with nursing faculty as well as those students entering the clinical nursing course sequence. Dr. Christos Douvris, assistant professor of chemistry, College of Science: “A Comprehensive Study for Retention Improvement in General Chemistry at McNeese State University” focuses on identifying the challenges associated with the retention of students taking general chemistry and then planning strategies and tactics that could lead to retention improvements. Each winner received a $5,000 stipend and a commemorative award statue.
" At a time when higher education is facing increased budget cuts, it's gratifying to be able to work closely with our quality local university in support of exciting and fresh new learning opportunities for college students across our region. We congratulate the winners of this year's Pinnacle Excellence Awards for their innovative ideas and their passion for education," said L'Auberge Senior Vice President and General Manager Keith W. Henson. "These awards recognize our faculty's commitment to enhancing our students' success. The focus of this year's awards supports our Quality Enhancement Plan for improving faculty advising of our students as they progress through their degree program and prepare for careers after they graduate," Said McNeese President Philip Williams. The Pinnacle Excellence Awards were established in 2003 by Pinnacle and McNeese to recognize outstanding faculty achievement. Since then, Pinnacle has given $330,000 in awards to McNeese professors.